Oh my goodness — aren’t I adorable? 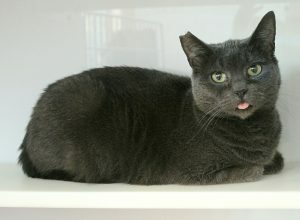 My name is Gracie, and I am just about the sweetest little 6-year-old lady cat you will ever meet! 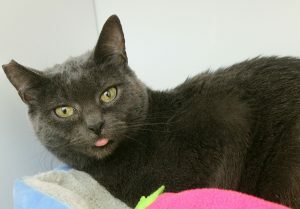 I am very soft and snuggly, and my tongue often pokes out which just gives me the cutest character. I have a very calm and affectionate demeanor, and am extremely receptive to any attention I can get. I have very soft fur and will roll over and purr for pets. I’m still young and definitely have a playful side, and would probably do well with a family with older children or with a couple or single person. I’m not quite sure how I feel about other animals, but could probably adjust well to other pets in the home if I was given time to acclimate. My favorite thing so far seems to be snuggling in a warm fluffy bed or better yet — a warm lap! I know I will be a great companion for anyone who is looking for a soft, adorable kitty to brighten their day. I mean, how can you look at this face and not smile? I’m a little goofy, a lot lovey, and just a great kitty in a little package. Are you interested in meeting me? Come down to Pixie today! I come to you fixed, vaccinated, and micro-chipped for an adoption fee of $100.